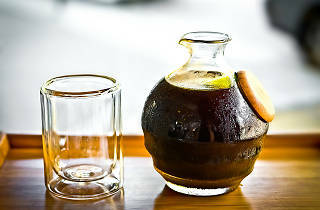 Photograph: Amparo Rios Cold-brew coffee at Demitasse. 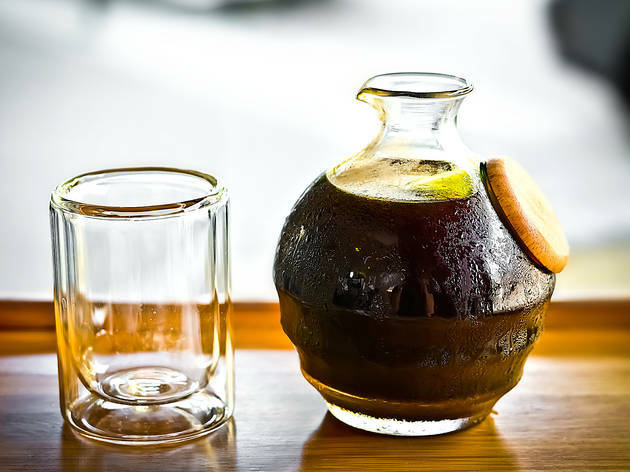 Japanese-style cold brewed coffee is the specialty of this trendy neighborhood coffee shop, which has an impressive display of siphons on the shelves and a menu that breaks down the subtle differences in flavor of each blend, note by note. With a rotating list of beans from various parts of the world, you may visit this shop and never get two cups of coffee alike. One constant: the luxurious sipping chocolate that arrives with a giant, roasted marshmallow. Don't expect to settle into comfy sofas, though—the shop is all about clean, modern lines with high top chairs and tables, as well as an outside patio. A classic cafe right near Little Tokyo. It's located kind of hidden off the main road. Demitasse has a great selection of coffees, teas, and pastries. For a non coffee drinker, Demitasse has a great selection. The matcha green tea is fantastic and over ice too! The space is very nice as it's calming, relaxing, and very modern. There's limited seating but people tend to come and go quite quickly. One of the BEST espressos I've had in LA. Plus, the place is cozy, classy, and their bakeries are excellent with an original twist you usually don't find at a café. I tried their ham &cheese croissants, and it came with a little coronation on top of it, a simple and savory addition that made the croissant taste even better.